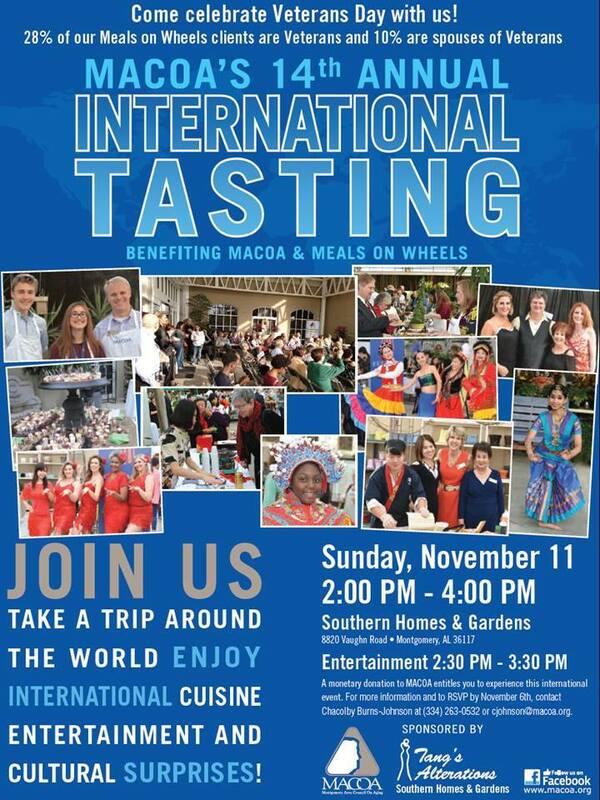 Join us for the 14th Annual International Tasting to enjoy culture, cuisine, and customs at this festive event to support MACOA and Meals on Wheels! Through Meals on Wheels we serve 404 hot nutritious and delicious noon meals each Monday through Friday delivered directly to the doorsteps of home bound senior citizens in Montgomery, AL! We have over 300seniors on our waiting list to receive meals and this charity benefit will help raise funds for our program and services! The International Tasting will feature delicious International Food, exciting Entertainment, traditional Customs, and other Cultural Surprises! The #MACOATaste is Co-Sponsored by Publix Charities and Wells Fargo! A monetary donation to MACOA and Meals on Wheels is required to experience this charity outing. As an added bonus all guests will recieve a 20% discount compliments of Southern Homes & Gardens on items purchased during the afternoon in support of MACOA.